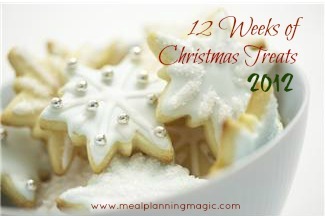 It’s the eighth week of the 12 Weeks of Christmas Treats blog hop hosted by Brenda Thompson from MealPlanningMagic.com. If you’d like to join us, please fill out the form on Brenda’s blog. Welcome back and thanks for reading about all the Christmas cookies I make. Today I’m sharing another recipe that I’ve been making for the past several Christmases. These are decorated cookies and since I’m sharing them with you, I made some changes to make them look a little less cartoonish (that’s a new word – no need to thank me). I also used some tips from Bridget at Bake at 350 while making these. Since Bridget makes the most beautiful cookies, I thought that my cookies would look better by following her lead. As I mentioned last week, the star I cut out of the Mini Linzer cookie tops are used at the top of the Christmas Tree cookies. I iced the stars and topped with sparkling sugar to give them a little sugar bling. Using an inexpensive cookie sheet (tips via Bridget), line it with wax paper and placed the cookies along the edges so they could be decorated without smearing any of them. Then I ringed the cookies with a thin bead of icing (another Bridget tip). I turned the cookie sheet as I went along until they were all done (another Bridget tip). I filled in the center of the cookies with icing and before the icing dried, I added the star at the top, used Sugar Pearl Sprinkles for the garland and melted chocolate for the trunk. Step 1: Preheat oven to 350 degrees. Line two cookie sheets with parchment paper and set aside. Step 2: In a large bowl, combine the butter, egg, vanilla and sugar and blend with an electric mixer, since this is a small dough a hand held mixer will do. In a small bowl, combine flour, baking powder and salt. Stir flour mixture to the butter mixture until just combined – this will be more of a folding motion rather than stirring. Shape dough into a flat disc. Wrap in plastic wrap and refrigerate for several hours or overnight. Step 3: Place the chilled dough onto a lightly floured surface and roll to 3/8 inch thick with a floured rolling pin. 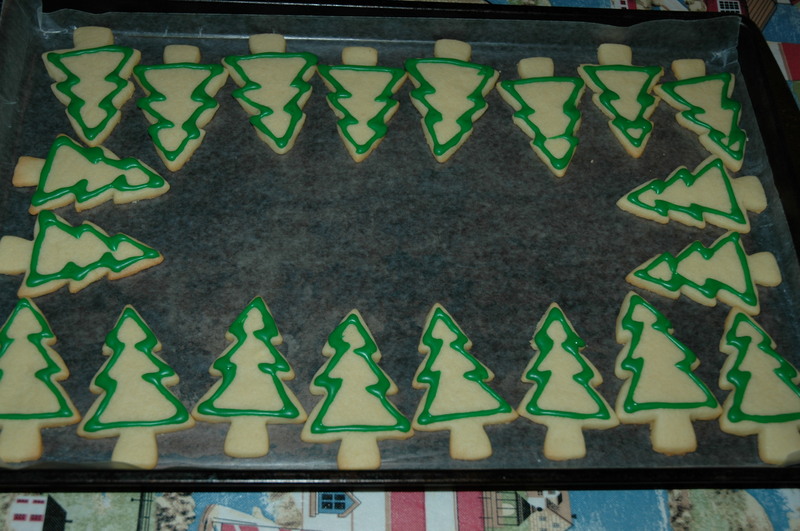 Using a 4 1/2 to 5 inch Christmas Tree shaped cookie cutter, cut out cookies. After you finish cutting the rolled dough, you can gather the scraps into a flat disc and roll out the dough again and repeat cutting out the cookies. Step 4: Place the cookies on the cookie sheet about 1 1/2 inches apart and refrigerate for 15 minutes. Bake chilled cookies 10 – 12 minutes until edges begin to become golden. Cool 10 minutes on cookie sheets. Carefully move cookies to cooling racks and let cool completely. Repeat for the remaining cookies. Step 5: For the icing (make 1/4 or 1/2 the recipe), combine the powdered egg whites, powdered sugar and water in a bowl. The icing should be the consistency of honey. Reserve two teaspoons of the icing to remain as white. Mix in enough of the green food coloring to the remaining icing to turn it a vibrant green color. Step 6: Line an inexpensive cookie sheet with wax paper. On top of the wax paper, ring the edges of the cookie sheet with the cooled cookies facing outward. Spoon 3 to 4 tablespoons of the green icing into the corner of a ziploc bag and cut about 1/8 inch of the tip off. Pipe the green icing along the outline of each of the cookies but bypassing the trunk at the bottom of the cookie. Cover the remaining green icing with a damp paper towel and then plastic wrap to store until the next day. Step 7: While the outlined cookies are setting, pour 2 teaspoons of the white sparkling sugar into a small bowl, dip the star cut-outs from last week’s Mini Linzer cookies in the reserved white icing and then dip the iced side of the star into the white sparkling sugar. Place the stars iced and sugared side up on a platter to dry. Step 8: Since the outlined cookies have set a bit, use a small spatula to spread the melted chocolate on the cookies’ tree trunks. I used a demitasse spoon because I’m just more comfortable using spoons rather than a spatula. After all the cookies’ trunks are finished, let the outline and chocolate dry overnight. Step 9: Stir the green frosting to ensure it hasn’t separated. Using a spatula, fill in the outlined cookies to the edge of the outline. After filling in several, go back to the first one and add the star at the top of each filled cookie and then add the sugar pearl sprinkles in rows to look like garland. 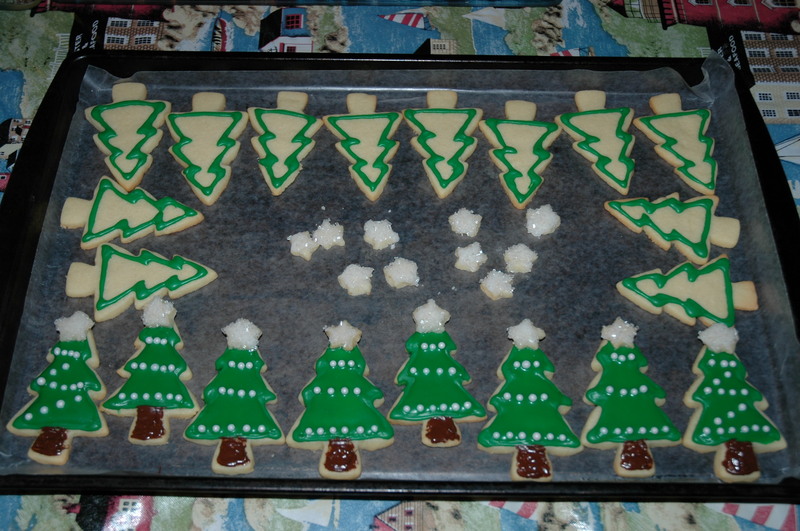 I added a row from each point on one side of the cookie to the other and then some of them I added a swag going diagonally from one row of garland to the other – to look almost like a z. Repeat in batches of several cookies for the remaining cookies. Let dry overnight. Storing: Store cookies in a sealed plastic container. The cookies are fine for many days when stored this way. Recipe from Family Circle magazine, 12/12/2000. 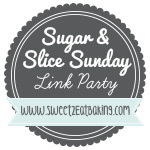 Have a look at the other great cookies in the blog hop by clicking on the Linky Tools link below. Sorry my blog doesn’t support the blog hop participant icons directly. This post was also entered in the following linky parties. Click the button below to see the other great cookies in the blog hop. 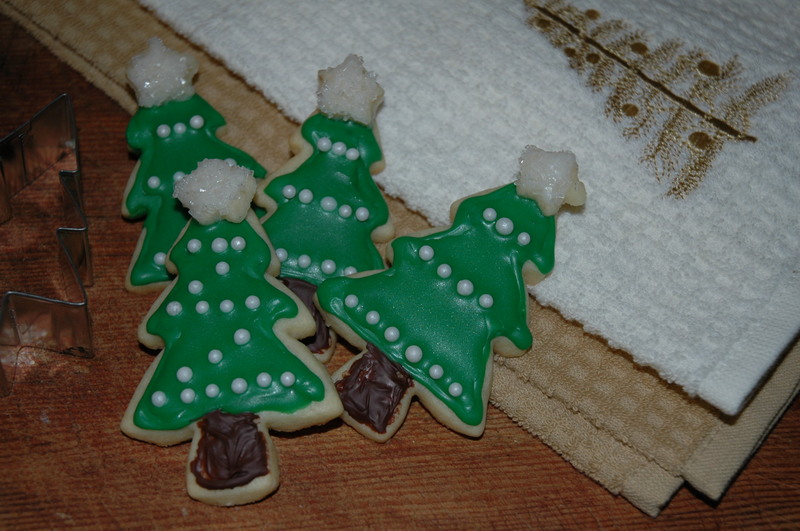 This entry was posted in Christmas, Cookie, Dessert and tagged Christmas, cookie, vanilla by Annamaria @ Bakewell Junction. Bookmark the permalink. Thank you. Thanks for stopping by. Beautiful! I wish I could decorate half as well as you can! Thank you. These are about the only decorated cookies I make. These are so cute. 🙂 The stars on top are my favorite detail! My husband loved the stars too. I just need to make sure he doesn’t eat them all before I get to attach them to the cookies. These don’t have a whole lot of detail, so they weren’t too time consuming. These are such beautiful cookies! I need to learn how to decorate like that! I bet you could make these cookies. I chose them because they were easier than some of the other Christmas shapes. These are adorable! I love how you decorated them. Thanks. Glad you stopped by. Thanks. They were an easy addition. My family begs for iced sugar cookies each Christmas! Yours are perfect!!! Thanks. They do take longer than other cookies but everyone seems to love them. Thank you. Glad you liked them. Such great tips. Your trees look beautiful! Thank you. Glad you stopped by. I’ve been looking for a good sugar cookie recipe – I should try yours out! Your cookies look absolutely adorable. You’ve got great decorating skills, girl! Thanks. I’d love to hear how yours turn out. Gorgeous Christmas Trees… so glad you found us. I hope to see you regularly at foodie friday. Thanks so much. Glad you could stop by. I love the little trees they are perfect. Thanks for being part of the linkz holiday party. Great looking cookies and wonderful tips. Thanks for stopping by our Happy Holidays Link Party – be sure to join us again this week (beginning on Saturday at 7 pm ET) and every week through the holidays.